MADRID (AP) — For Barcelona, three straight quarterfinal exits from the Champions League is quite a slump. The Catalan club has been plenty dominant at home, winning seven Spanish league titles in the last 10 years and claiming four straight Copa del Rey trophies. But the team has somewhat struggled in the top European competition after winning four times in a decade from 2006-15. Up next in the competition will be a trip to Old Trafford to face Manchester United in the first leg of the quarterfinals on Wednesday. 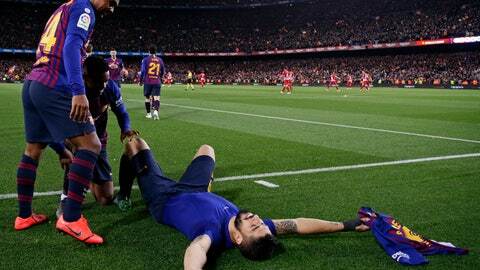 Barcelona will also play in the Copa del Rey final against Valencia in May, and it’s nearing another league title after beating second-place Atletico Madrid on Saturday to open an 11-point lead with seven matches remaining. The last time Barcelona advanced past the Champions League quarterfinals was in 2015, when it eventually won its fifth European title and completed the treble for the last time. United, which has been revitalized since the arrival of Ole Gunnar Solskjaer as manager, has only the Champions League to play for in terms of trophies. But the English team is also looking for a top-four finish in the Premier League to ensure Champions League participation next season. The second leg will be on April 16 at the Camp Nou. Last season, Barcelona had advanced to the Copa del Rey final and held a comfortable lead in the Spanish league before it lost to Roma in the Champions League quarterfinals. But Barcelona president Josep Bartomeu said the team is right where it wanted to be at this point of the season.